Showing results for tags 'fossil fuels'. 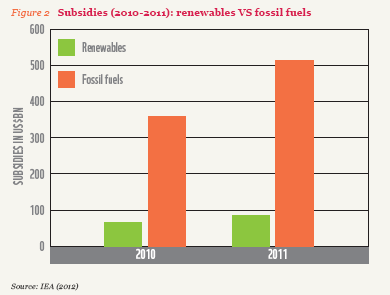 Fossil fuel subisidies are several times larger than "subsidies" to renewable energy! IPCC, the UN’s expert panel on climate change, released part three of their new global warming study yesterday. The new report says that the world’s current efforts to combat global warming are not sufficient if we want to avoid catastrophic climate change. If we are to keep global warming below the 2 degrees Celsius cap recommended by scientists, emissions from CO2 and other greenhouse gases must drop by 40 to 70 percent by 2050 – and drop even further to near-zero by the end of the century. To accomplish this, the world needs to urgently switch to clean and renewable energy. Clean energy sources will need to triple and completely dominate world energy by 2050, the IPCC report concludes. But the direct opposite is currently happening. 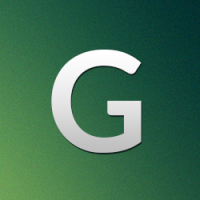 World emissions of various greenhouse gases are increasing. Between 2000 and 2010, average global emissions rose by 2.2 percent every year – reaching “unprecedented levels” of carbon dioxide in Earth's atmosphere. Increasing carbon emissions are largely due to an increasing demand for energy and a rising coal use in countries such as China. “There is a clear message from science: To avoid dangerous interference with the climate system, we need to move away from business as usual,” said Ottmar Edenhofer, one of three co-chairs of the IPCC working group. We need to end the current dominance of coal, oil and gas and replace them with cleaner and more renewable energy sources. But this is a daunting – and unprecedented – task when fossil fuels currently provide more than 80 percent of the world’s total energy production. “We can only avoid catastrophic climate change if we reduce our dependency on fossil fuels – we're already on track for four degrees warming, which will be impossible for human society to adapt to,” said Friends of the Earth's executive director Andy Atkins in a response to the new IPCC report. “We have the technology to prevent dangerous climate change. What we lack is the political will of our leaders to strongly champion renewable power and energy efficiency.” So-called CCS technologies, which capture and bury carbon emissions is one way to produce low-carbon energy. But the IPCC experts notes that this technology is not feasible as it “has not yet been applied at a large, commercial scale.” Gas could be important in the “short-term”, during the transition, but only if it replaces coal. One low-carbon energy option is nuclear power. But the IPCC report notes that nuclear “has been declining since 1993” and voices concern about potential safety risks, “nuclear weapon proliferation risks, waste management security as well as financial and regulatory risks.” The big emphasis in the IPCC report is on renewable energy sources and technologies, such as solar and wind power, but also energy efficiency and conservation. The IPCC report acknowledges how much renewable energy technologies have advanced since 2007. Since the last major IPCC study, “many [renewable energy] technologies have demonstrated substantial performance improvements and cost reductions, and a growing number of [renewable energy] technologies have achieved a level of maturity to enable deployment at significant scale,” the report says. “Regarding electricity generation alone, [renewable energy] accounted for just over half of the new electricity generating capacity added globally in 2012, led by growth in wind, hydro and solar power.” But renewable energy and various implementations against energy waste requires substantial long-term investments. And here’s the good news from the new IPCC report: a global roll-out of clean and renewable energy is remarkably cheap – but only if we act now. The investment required to green our global energy system would only result in a 0.06% reduction of off expected annual economic growth rates of 1.3%-3%, the IPCC report concludes. Read that again. It would only cost us 0.06% of annual economic growth to save the climate and make sure there will be a livable planet for future generations as well. That’s nothing. But only if we act now. “We cannot afford to lose another decade,” warned German economist Ottmar Edenhofer, a co-chair of the IPCC committee. “If we lose another decade, it becomes extremely costly to achieve climate stabilization.” Considering that the world spends over half a trillion dollars every year to subsidize fossil fuels – about six times more than the global investment into renewable energy – there is clearly room to divest and divert money from fossil fuels into renewable energy. And a transition towards clean and renewable energy would also result in health benefits, as professor Nicholas Stern notes. “The transition to sustainable low-carbon economic development and growth is an opportunity not just to avoid potentially catastrophic climate risks, but also to reap other benefits from cleaner and more efficient technologies, such as reductions in local air pollution,” Stern said. “There is only plan A: collective action to reduce emissions now,” EU commissioner Connie Hedegaard said. “The more you wait, the more it will cost. The more you wait, the more difficult it will become.” And US Secretary of State John Kerry agrees with that sentiment: “Unless we act dramatically and quickly, science tells us our climate and our way of life are literally in jeopardy. […] Waiting is truly unaffordable. The costs of inaction are catastrophic,” he said. “We stand at a fork in road,” said Li Shuo, Greenpeace East Asia's climate and energy campaigner. “One way leads to more dependence on dwindling fossil fuels that are wrecking our climate and damaging our health; the other to a world powered by a booming clean energy sector that is already driving growth and creating jobs. The sooner we act, the cheaper it will be.” The IPCC study, titled Mitigation of climate change, is the last report of three IPCC working groups. The previous reports have looked at the current state of climate science and the impacts of unchecked climate change. This report was produced by 1250 international experts and has been approved by 194 governments.